Very fishy… Just does not add up! Not even a week has elapsed yet and already we have heard so many different narratives of osama’s death from him hiding behind his wife and using her as a human shield to the fact that he was unarmed to he was trying to grab a weapon! Which one… Please come up with a coherent story at least?? It’s is just unbelievable and all these different versions are from the Obama administration. Not the conspiracy theorists! Even Archbishop of Canterbury Rowan Williams finds the story contradictory. 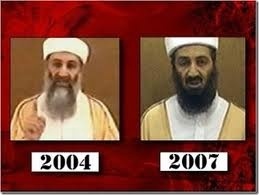 Now the recent talk of the town is, should the pics of osama’s death be published for the public to see? Personally, I think even if they were released nothing would change. However, their (obama’s party) arguments for it being graphic is quite pathetic! Simply because, if these pics are too graphic then I’m sure that they can release the video before he was shot or at least the steps leading to that final moments. As I’m certain they have video recorded of the most crucial event of the last decade. The capture and death of the most wanted man in the world! Let’s say they did not record the final stages (just giving them the benefit of doubt here). Then at least release footage of the interview of bin ladens daughter in which she Identified her father at the crime scene as reported by CBS News and others. Or at least the aftermath interview that the officials did after the people in the compound were taken for questioning. It gave momentum for the bush administration’s cause. It helped win people over to his cause. Likewise these pics of his son’s death (Osama’s) will have the same effect if not better. It will silence many of the detractors and naysayers. As well as this people will see and believe more of the death of the most wanted man. Simply because his son will have many of his fathers features hence give solutions to people that his father must have been with him at the time. And that it is indeed him. Even if they say this is not possible then why not show the interviews or ‘interrogations’ of bin laden’s family. The scene when his daughter identified that indeed it was her father who was murdered. Or an clip from the instance were his wife testified that it was him and he was killed. All the news cooperations ran stories where either his daughter verified his death. Or the fact that his wife tried to help him. Any of these footages would be enough to silence all the doubters so to speak. Now, you can’t tell me none of these things can’t be put out onto the public domain as they are too ‘graphic’! C’mon Obama the people are not that stupid or simple! Even now (having just read the BBC news and the SKY news websites. They refer to Osama bin Laden as “believed to be behind the 9/11 attacks”. They don’t say he ‘was’ behind the attacks with a certainty of factual intelligence. Looks like even they admit maybe he was NOT behind the infamous 9/11 attacks. The day everything changed. “Bin Laden was believed to be the mastermind of the 9/11 attacks in 2001”.